This is a new first. 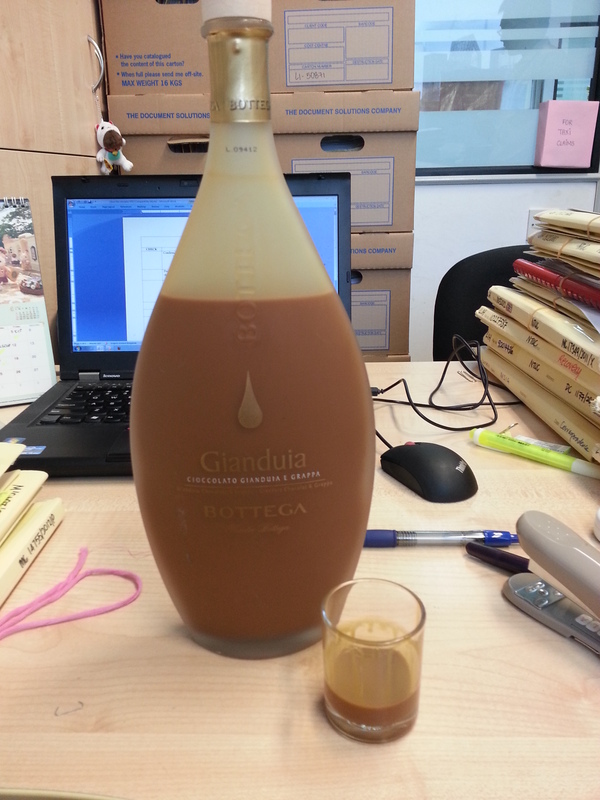 I have never had to resort to drinking at my desk until today. It’s really good though. Chocolate + Grappa really hits the spot. Champagne Truffle and I stood around my desk with one shot each. We sipped. We collectively sighed. We downed it, then we carried on. Our souls fortified, as the Russians would say. I’m surprised I haven’t thought of this earlier. I lost my voice the whole of last week but found it again this week. It brought a friend home, however. A friend named Cough. I’ve done a whole bottle of 京都念慈菴川貝枇杷膏. It’s still here, sitting deep in my throat, threatening to hack up my lungs. I’ve done a shot of Brandy Apricot on two consecutive nights [because I have run out of Benedictine DOM or Yomeishu and have no champagne…all of which were previously employed to cure coughs to varying degrees of successes]. All that did was to tickle it and made it laugh, which is really not a pleasant experience. I have since come to the conclusion that the Brandy Apricot has probably been around for too long to do the nececssary. So last night, I had a shot of Limoncino. Thirty minutes later, the itch in my throat went into hiding. It’s still there this morning, but very much less so. It’s gone from sitting to lurking around. I’ll probably do another shot tonight for good measure. So even though it may sound completely madcap, do take me seriously when I tell you that alcohol would solve most of your problems.